These tops are a short version of the standard knitted velour kaftan. They are free-sized and suitable for UK dress sizes 14 to 30. Machine-washable, non-iron soft and comfortable fabric. Length is approximately 31", but if you would like it shorter or longer, please send a message. It's easy to wear. Can be worn on it's own or over other clothing. Great with trousers or a skirt. We actually do sell matching elastic-waist trousers and this makes a suit that is suitable for day-wear for either going out or as a lounger to relax in, daytime or evening. Elasticated waist skirts can also be available. Please ask. You can dress this top up with jewellery or a scarf. The fabric is so easy to wash. It is tumble dryable, or you can just hang it up to dry. There is absolutely no need whatsoever for ironing this garment. It is wonderful and free-flowing. It can last for years and years. Available in a range of beautiful colours. KAFTAN TOP IN CRUSHED VELOUR AVAILABLE IN TEN COLOURS These Free-sized tops are made in soft jersey panne-velvet that drapes beautifully to flatter almost any figure size between UK 14 and 28. The fabric is washable, non-iron and crease-resistant. All the garments that ..
VELOUR TOP - PLATINUM PERFECTION Dark-grey with floral outline-sletched design in silver. 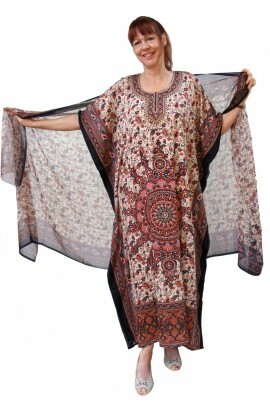 A lovely new Kaftan Top suitable for all occasions. A fabulous plus size top to wear on with trousers or a skirt. It will lend itself to being dressed up with jewellery, a scarf or a stole. ..
VELOUR TOP - WINE GLORY Wine with floral outline-sletched design in silver. A lovely new Kaftan Top suitable for all occasions. A fabulous plus size top to wear on with trousers or a skirt. It will lend itself to being dressed up with jewellery, a scarf or a stole. Loose-fitting ..
VELOUR TOP -GOLD-SILVER-FLORAL Dark-grey floral design on rich gold. A lovely new Kaftan Top suitable for all occasions. A fabulous plus size top to wear on with trousers or a skirt. It will lend itself to being dressed up with jewellery, a scarf or a stole. Loose-fitting and sui..
A loose Top in Printed Velour. It is free-sized and suitable for UK dress sizes 14, 16, 18, 20, 22, 24, 26, 28 30. Length is approximately 31", but if you would like it shorter or longer, please send a message. It's easy to wear. Can be worn on it's own or over other clothin..